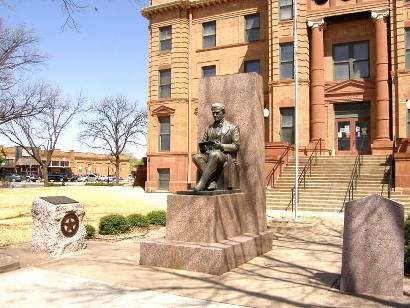 Jones County Courthouse, Anson, Texas. 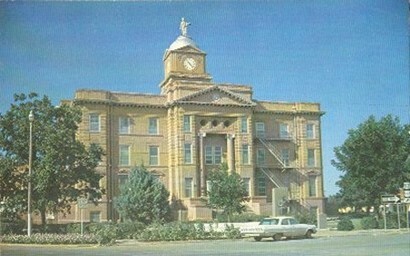 The Jones County Courthouse was completed at a cost of $100,000. 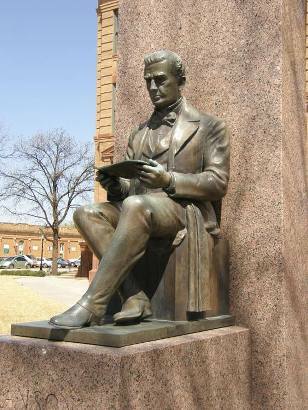 The Seventh Texas Legislature created Jones County in 1858 and named it for Anson Jones, the last president of the Republic of Texas. The Civil War, Reconstruction, and the area's untamed wilderness combined to postpone the county's formal organization until 1881. 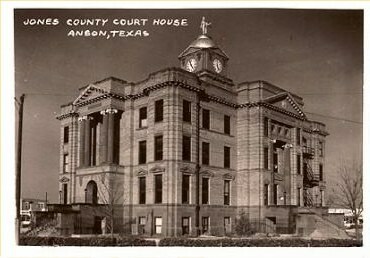 Voters selected Jones City, later renamed Anson, as permanent county seat. 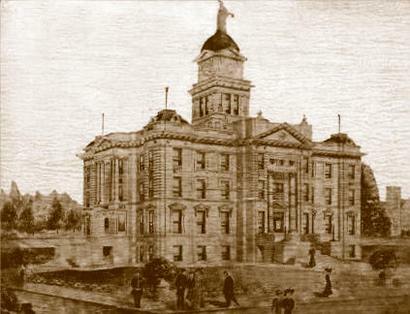 The first permanent courthouse was a small frame building, which served until the county purchased a hotel in 1884 for use as a courthouse. 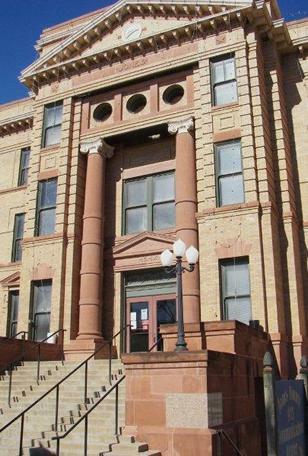 An 1886 brick courthouse served the county for the next 24 years. 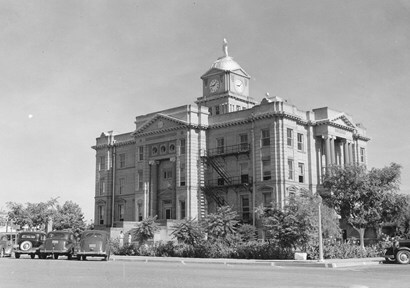 In late 1909, the Jones County commissioners court, led by County Judge J. R. Stinson, determined that the growth of the county called for a larger courthouse. They selected Elmer G. Withers of Stamford (15 mi. N) and the Texas Building Company of Fort Worth as architect and contractor, respectively. 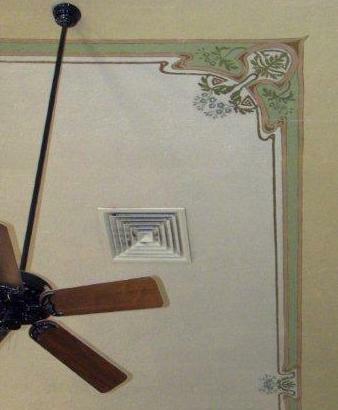 Completed in 1910, the Jones County courthouse is an excellent example of Beaux Arts styling, with influences from the Arts and Crafts movement found in the decorative painting uncovered during a 1990s rehabilitation on the ceiling of the district courtroom. Other notable features include the statue of Lady Justice atop the domed clock tower and the pedimented porticoes with flanking pairs of Ionic columns on each fa�ade. 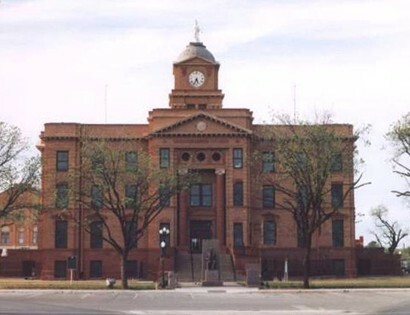 Constructed of brick and Pecos red sandstone, the Jones County courthouse continues to stand as an important part of Anson's architectural heritage and a center of politics and government for the citizens of the county. 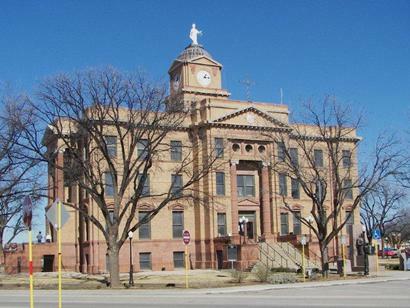 "The roof was remodeled shortly after this courthouse was built, removing the turrets on the corner pavilions and shortening the height of the clock tower." "The door on the side of the front entrance staircase leads to the basement where there is a small county museum. Site of emigrant trail, the frontier military road, and Fort Phantom Hill, founded in 1851 to guard the military road. County created 1858 from Bexar and Bosque counties. Named for Anson Jones (1798-1858), a veteran of San Jacinto, minister to the U.S., Secretary of State and last President of the Texas Republic. Phantom Hill, in 1858-1861 a Butterfield Overland Mail Station, was in 1861-1865 a Civil War patrol point, trying to curb frontier raids by Indians. 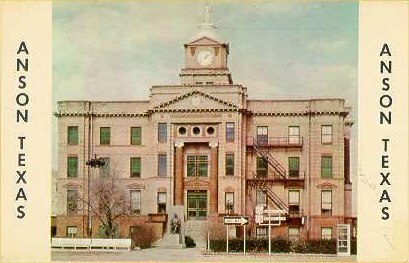 The county was recreated in 1876, organized 1881. Anson (at first called Jones City) is county seat. 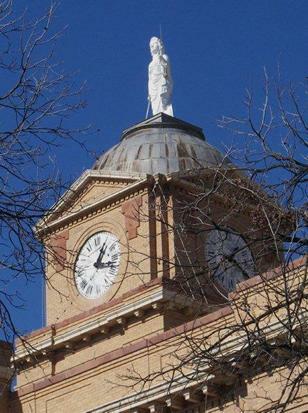 A closer view of the clock tower with a statue of Themis on top of the dome. Jones County Courthouse front entrance. 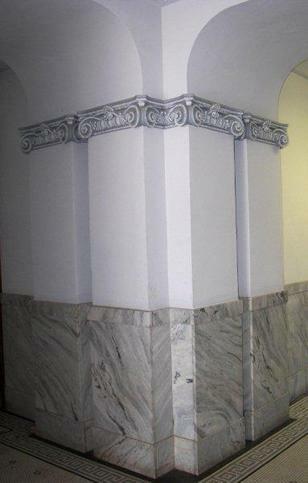 Decorative capitals in the main floor hallway. 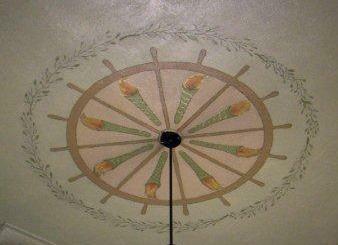 Detailed artwork on the ceiling of the district courtroom. 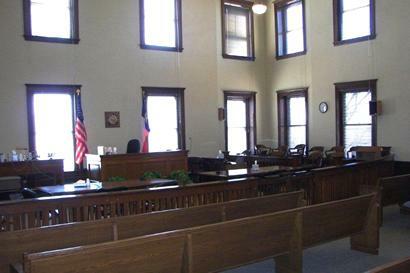 "The district courtroom retains its original two-story height, but the upper gallery in the rear of the courtroom has been removed."